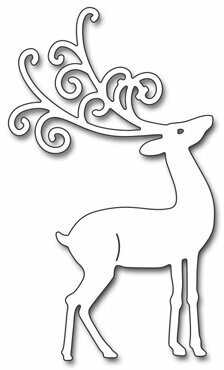 Frantic Stamper Precision Die - Santa Sleigh and Deer. We've done a Santa and sleigh die before, but this one is a bit different. Santa's sleigh is pulled by one large detailed reindeer. This die is nice and large, allowing you to use it as a focal point on a card, rather than just Santa in the sky. The die measures 4" x 1.875". Our Frantic Stamper Precision Dies work in most consumer table top die cutting machines such as the PressBoss, Cuttlebug, Big Shot, vagabond, Boss Cut, and Grand Calibur. Some dies may require the use of a metal shim depending on your machine. This prancing little deer fits perfectly inside the snowglobe (FRA9668), but you can certainly also use it alone for your snowy scenes too! Deer measures 1" x 1.875". 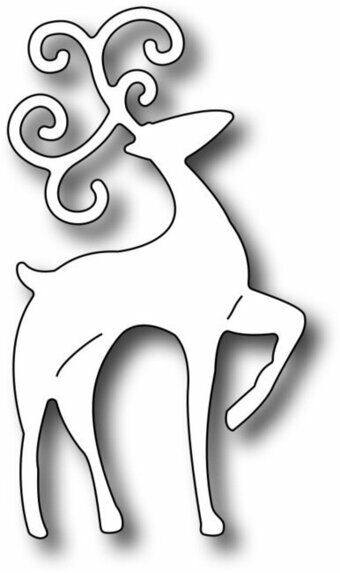 Tattered Lace Essentials Die - Christmas Cuties Reindeer. Detailed and Delicate, Tattered Lace Dies are the most intricate dies available. This Essentials by Tattered Lace die is a must have for all your projects, giving you the perfect size shape any time. This die measures approximately 2.68" x 3.23".